All of our gutter cleaning is done with Health & Safety in mind but providing excellent results. 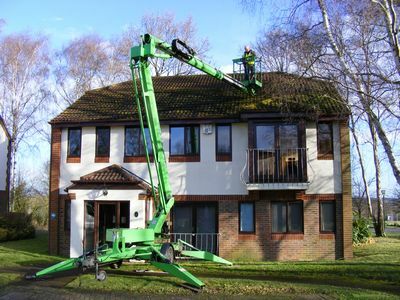 This can be done via the use of MEWPs or via the use of our high powered Gutter-Vac System. Our Gutter-vac System is a 4200 watt vacuum that is attached to a telescopic pole with a reach of up to 48 foot. This means debris can be removed from the gutter from the safety of the ground and without the cost of hiring powered access. Our high pressure washer with telescopic poles can then be used to insure gutters are flowing freely and that down-pipes are cleared.